Egyptians held their breath Sunday amid fears star striker Mohamed Salah could miss the World Cup after suffering an injury when wrestled to the ground by Real Madrid captain Sergio Ramos in the Champions League final. 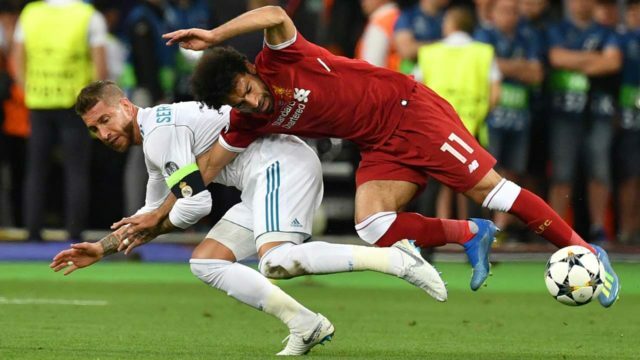 Ramos, who locked arms with Salah before falling on top of the forward’s shoulder, became an instant hate figure for millions of Egyptians on social media, as well as the thousands who watched the game live at cafes. “Ramos the Dog”, “Animal”, “We will take revenge”, “Dirty” and many more insults were thrown at Ramos on social media following Real’s 3-1 win over Liverpool in Kiev. Salah left the pitch in tears holding his shoulder after just half an hour, a sight that prompted some Egyptians to burst into tears. Reported to have suffered a sprain in his shoulder ligaments, Salah remains doubtful for the World Cup in Russia, with the clock ticking before Egypt’s first game against Uruguay on June 15. If the vitriol targeting Ramos seems exaggerated, it reflects how vital the speedy striker has become for his national team ahead of this summer’s World Cup. The 25-year-old scored 44 goals in all competitions for Liverpool last season, a tally that earned him the Golden Boot for Europe’s top scorer and the Professional Footballers’ Association Player of the Year. Without him, Egypt’s chances are “almost non-existent”, said Karim Said, editor-in-chief of YallaKora, a football-focused website. “The (team’s) attack is mainly based on Salah,” said Said. Thanks to Salah, who has become a source of pride for millions across the Arab world, Egyptians were looking to the World Cup with hope and enthusiasm. Ramos’s dubious tackle, which went unpunished by match referee Milorad Mazic, prompted one furious fan watching the game to yell “Dirty guy” at the Spaniard, although his screams were drowned out by a sea of other insults. On Sunday morning, the headline on Egyptian newspaper El Watan said it was reverting Ramos’s fate to God, in a tone echoed on social media networks. Ramos’s Facebook and Twitter accounts have been flooded with insults in Arabic and English, some even translated into Spanish. A petition was even launched on the change.org platform, calling on FIFA and UEFA to punish Ramos for “intentionally hurting Mohamed Salah”. The petition has collected more than 111,000 signatures. Ramos sent Salah a “Get Well Soon” Twitter message, adding he regretted that football “sometimes (shows) its bad side”, but “above all, we are comrades”. Despite the anger some Egyptians remain optimistic, taking the incident with the philosophy of the Muslim holy month of Ramadan. “He will participate in the World Cup and everything will be fine, God willing,” said Mahmoud Saad, a Salah and Real Madrid fan, as he watched the match at a cafe in downtown Cairo. The Egyptian Minister Youth and Sports Khaled Abd Elaziz also expressed optimism.”Mohamed Salah, God willing, will be on the national team list for the World Cup, which is to be announced on June 4,” Abd Elaziz said on Facebook. “Relief in Egypt’s streets after the medical report,” a headline in the state-run Ah-Ahram newspaper said.The Al-Akhbar newspaper was even more optimistic — its headline was “Salah to participate at the World Cup”.